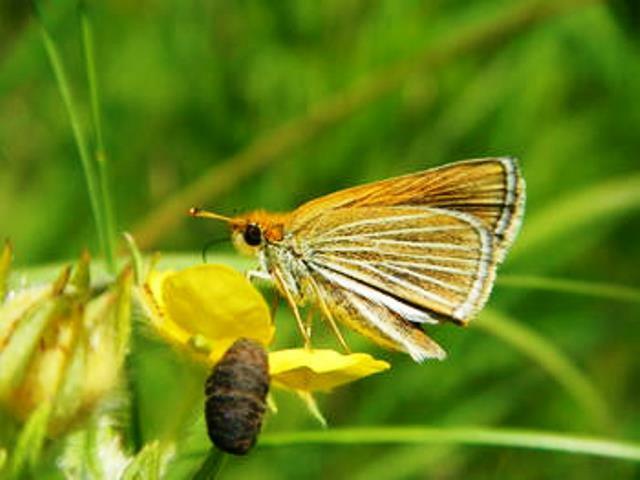 The Poweshiek Skipperling is an endangered butterfly that lives mainly in prairie fen wetlands in southeast Michigan. Image: Dave Cuthrell, MSU Extension. We’re all familiar with the phrase “like finding a needle in a haystack.” Even if you’ve never actually searched for said needle, you can probably imagine how difficult the task can be. Imagine the needle has wings and the haystack is a couple hundred acres wide. That pretty much sums up the environmental expedition Current State’s Kevin Lavery went on recently with a team of experts in search of a tiny butterfly that’s made it onto the U.S. endangered species list. They were looking for a butterfly called the Poweshiek Skipperling. It’s only found in a half a dozen places on Earth, and two-thirds of them are in Michigan. This story first appeared on WKAR’s Current Stateand is republished here with permission.